As much as I love a gorgeous full face of makeup (full-coverage foundation, statement-making lips, dramatic eyeshadow, lashes — the entire shebang, if you will), on a daily basis, I’m more of a “no makeup-makeup” kind of girl. You know the look where it appears as if you’re not wearing anything (at least to a makeup novice — it’s not that undetectable), although you’ve actually slathered on ten different products to pull it off. My proclivity for simplicity really comes down laziness. Not because I’m particularly partial to the aesthetic of a naturally glowy, pared-down face. Most days, I just can’t be bothered to spend more than 10 to 15 minutes painting my face on — if that. That’s precisely why I love CC creams (short for color correcting). Sure, most of the options at the makeup counter won’t cover up blemishes or spots on your face, so you usually need to pair it with concealer, but they do an incredible job at evening and smoothing out your complexion. Additionally, they typically have a skin-like finish, so you don’t look too cakey or overdone. Luckily for me, there’s now a matte version of my beloved CC cream, and I’ve been able to try it recently! 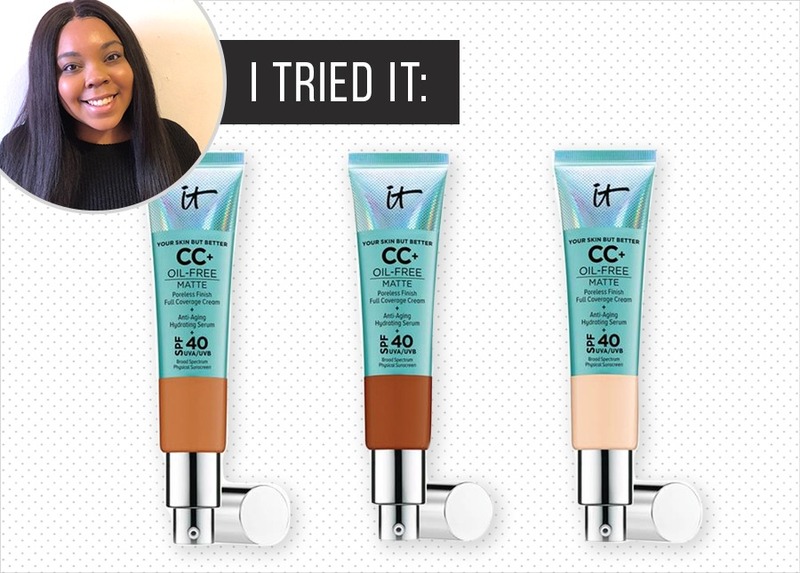 The IT Cosmetics Your Skin But Better CC+ Cream Oil-Free Matte ($38) (did you actually expect them to change that clever name?) bears the same qualities as the brand’s first CC cream, including SPF — the only major difference is its 12-hour matte finish. I’ve been able to give it a test run twice now and really enjoyed how my skin looked both times. My pores were virtually nonexistent, my skin looked airbrushed, and I managed to stay completely matte even after a full day of wear. Plus, it didn’t give me that dreaded white cast people with high levels of melanin usually get when they use products with SPF that aren’t formulated with us in mind. One issue I did have, though, had everything to do with the color and nothing with how the product performed. I used the shade “rich,” the same one that worked on me and matched me perfectly in the original CC cream, yet, in this iteration, it turned out to be a smidgen lighter. That was quite strange. Thankfully, I was able to make it work, so it wasn’t a waste of money. I just couldn’t use too much, or else I’d look ghastly. Still, it bothered me that despite bearing the same name, the shade was noticeably different. Overall, I was smitten with the results from the new matte CC cream. I just wish IT Cosmetics would expand the shade range so more people with deeper skin tones could give it a go on themselves and see what all of the hype is all about. It also wouldn’t hurt if they brought the price down a notch, as $38 for a CC cream that is more medium-coverage than full is, in my opinion, a tad steep. All in all, though, just like the other version, this matte one will definitely become a regular in my everyday makeup lineup.